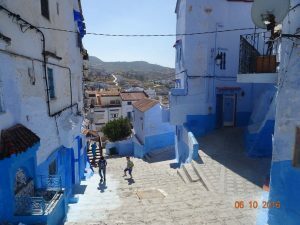 we will pick you up from your hotel/port and stars our Northern tour driving through the Rif mountains and Tetouan city to enjoy the views of the beautiful mountains till we get to Chefchaouen one of the stunning villages in the feet of Rif mountains chefchaouen medina had a Spanish-style square surrounded by many funky arts and crafts stores, roof-top restaurants and cafes where you will have lunch before we continue our way to Fes.Overnight at hotel/Riad. We will pick you up from your riad / hotel, then drive south to Ifrane and Azrou through the Middle Atlas mountains. On the way we will stop at the cedar forests to see the Barbarian Apes in their natural habitat.Travelling through the Tizi Ntalghamt pass to Midelt and along the magnificent Ziz Gorges carved through volcanic rock.After lunch we’ll continue our journey through the Ziz Valley to Erfoud, Rissani and Merzouga. After a glass of mint tea, we’ll leave our luggage in a safe room then take a camel ride to a Berber camp in the middle of the Erg Chebbi .The camel trek takes about 1hr 30 min from to the camp where we will set up Berber tents for our night in the desert.After dinner we will gather around the fire and enjoy the sound of traditional Berber drums under the stars. We will make up early in the morning to watch the best sunrise of your life and casting different shadows and colours over the the sea of sand dunes, the highest in Morocco, before returning to our desert hotel,after breakfast,We will continue to Tinghir and the stunning Todra Gorge the highest, narrowest gorges in Morocco. the gorge is great spot for hiking and relaxing on the edge of the river or sampling some local Berber delicacies. After lunch in the heart of the gorge we’ll drive through the Dades Valley where we will end our day spending the night in local hotel/Riad.